Maybe you’re a long-time vaper who is considering adding CBD to your routine, or, you could be a veteran CBD user who is looking to test different products. Whatever your reason, you are asking the question, “What are the effects of CBD Vape Oil?” As one of the leading brands behind different CBD vape products, we are going to do our best to answer your question to our fullest ability. In this article, we’ll discuss what CBD Vape Oil is, what CBD Vape Oil effects are, and talk about any potential unique impacts that CBD Vape Oil can have compared to other CBD products. If you are looking for an in-depth explanation on CBD (Cannabidiol) or CBD Vape Oil effects, we encourage our readers to check out our CBD Guide. Here, we’ll give you a basic overview of CBD to better understand the compound’s common effects. CBD stands for “Cannabidiol,” which is one of many so-called “cannabinoids,” the compounds secreted by the Cannabis/Hemp plant. CBD can be derived from either the Hemp or Cannabis plant, which is classified by the amount of THC they contain. CBD is not considered “psychoactive,” like THC is. CBD is non-psychoactive because it does not activate certain “receptors” within your body’s endocannabinoid system. When THC enters your system, it pairs with a receptor, named CB1. It’s this action that gives THC its “high effect.” CBD does not bind with receptors and can even “bring down” and moderate the high experienced by THC. Before CBD can become available as a product, it has to go through an extraction process to separate it from the other raw plant materials. The best method for extraction is something called “CO2,” or Carbon Dioxide Extraction. That process involves changing pressure and temperature conditions to put Carbon Dioxide in a “supercritical” state, somewhere between a liquid and gas. In this state, it is a perfect consistency to separate CBD from other plant materials. Once the CBD is isolated, it is ready to be manufactured, packaged, and offered to the consumer. Typical products include CBD edibles, topicals, tinctures, and vape oils. As we mentioned in the last section, CBD vape oils are a type of consumer product - a take on the traditional vape oil or “e-liquid.” Vape Oils are the concentrated liquids that one puts in a vaporizer to turn into a vapor to be inhaled. As well as CBD, CBD Vape Oils typically have water, food-grade flavoring, propylene glycol (pg), vegetable glycerine (VG), and may or may not contain nicotine. 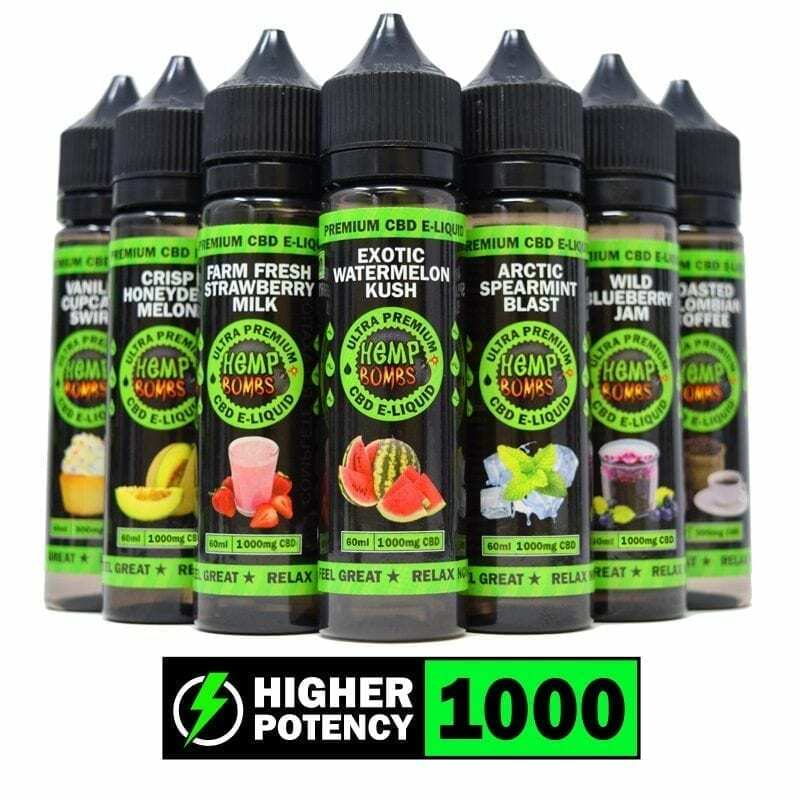 Hemp Bombs Vape products do not contain nicotine which may provide beneficial CBD Vape Oil effects. Propylene glycol is a substance that used in CBD vape oils to help even out the taste. PG can also be found in vanilla extracts, food dye, and medicines. Vegetable glycerin is a vegetable based liquid that is both thick and sweet. VG is found commonly in food and beauty products. In CBD Vape Oils, VG produces a more delicious flavor, more massive vapor, and slighter throat hit. There is a debate among vapers and vape manufacturers about what the best PG and VG ratio, or blend, is. Higher PG blends seem to have a lighter “throat hit,” thinner consistency, and less cleanup compared to higher VG blends. A more significant amount of VG will produce more vapor and a sweeter taste. The conventional wisdom within the vaping industry is the CBD Vape Oils ideally have a 70/30 PG and VG ratio, although it is a matter of preference. 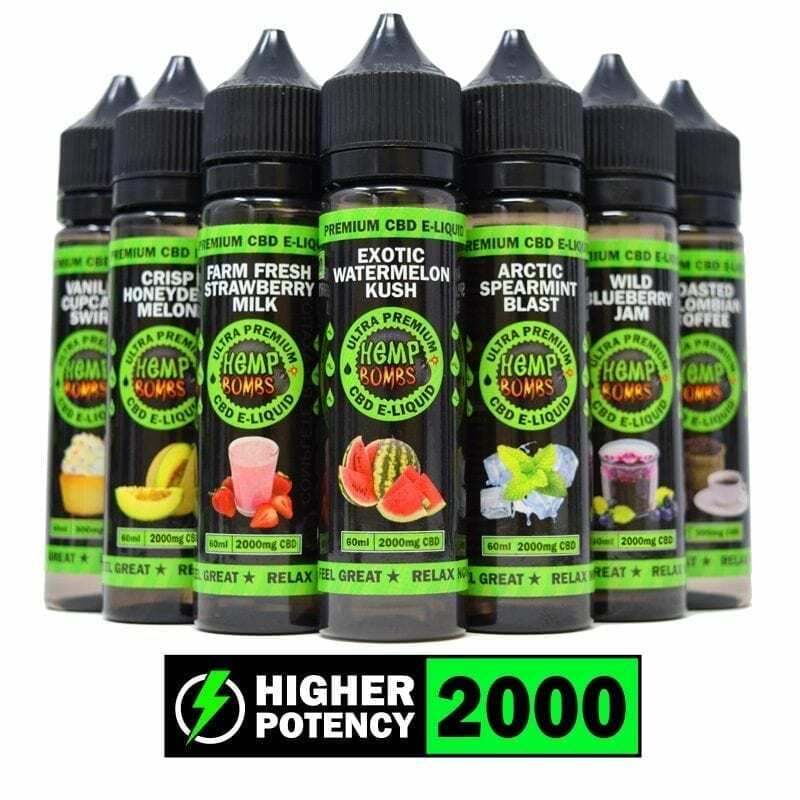 All of Hemp Bombs CBD Vape Oils have a 70/30 blend and contain no Diacetyl, an additive that can be used in e-liquids but is connected with lung damage. Make sure to research your vape product contents to ensure you receive beneficial CBD Vape Oil effects. How Do I Consume CBD Vape Oil? How to consume Vape Oil is a valid question! Now that we know what CBD Vape Oil is, we need to understand how we can absorb it. Before we get into any of the hardware, it’s crucial to know that there are two ways that you can inhale CBD Vape Oils, MTL (Mouth to Lung) and DL (Direct to Lung). In mouth to lung vaping, the vapor is stored in your mouth before it’s moved into your lungs, like sucking on a straw. In this method, the flavors are more pronounced, and the throat hit is typically less noticeable. In MTL vaping, vapers consume less juice, spend less battery, and get more flavor out of their vape oil. DL, or direct lung vaping, involves drawing vapor directly into the lungs like you are sucking air from a balloon. With indirect lung vaping, the hit is more intense, which many vapers tend to favor. DL vaping is typically performed a higher temperature, which eats up batteries quicker. DL vaping also produces thicker vapor than MTL vaping does. Now that we have a grip on the different ways to inhale CBD vape oil, it’s important to know the various equipment required to consume it. Pen mods look like their description - long, thin devices that resemble pens. They consist of a battery with a firing button, atomizer, and mouthpiece. They have low wattages and are convenient to carry around. Because of their relative simplicity, pen mods are the most popular type of vape device. Pen mods are also designed for ample vapor output. Box mods are bulkier devices that store anywhere from 1-4 batteries for longer battery life and higher wattage potential. WIth box mods, the wattage range is around 10w to 300w, depending on the device. Most commercial devices are regulated - meaning they have safety restrictions to prevent misfiring when the battery and atomizer aren’t working correctly. What Are the Effects of CBD Vape Oil? So now that we understand the basics of CBD, CBD Vape Oil composition, and consumption, we’ve reached a point we can discuss CBD Vape Oil effects. When one speaks about the potential effects of CBD Vape Oil, we are talking about the impacts that CBD has. The vape oil itself - water, VG, and PG - won’t produce any noticeable effects. It stands to reason that CBD Vape Oil should have many of the same effects that are common to other CBD products. In this section, we will touch on the beneficial impact that CBD is reported to have. One of the most commonly reported benefits of CBD is its anti-inflammatory effects. Many animal studies have supported CBD as an anti-inflammatory, most likely because of its role within the endocannabinoid system which controls the immune response. It is believed that a specific protein called Caspase is created when Cannabidiol influences overactive immune cells. This protein helps induce immune cell death, helping to manage unnecessary inflammation. Another area where CBD is said to have beneficial effects is in rest. CBD is known to increase daytime alertness (keep you awake at proper times), reduce anxiety, and minimize pain. By working in these ways, CBD leads to better rest, fewer sleep interruptions, and an ability to fall asleep easier. One of the primary reasons for the CBD boom is its antiepileptic effects. The antiepileptic effects of CBD Vape Oil are some of the most researched of any of its benefits. Studies from the New England Journal of Medicine and British Epilepsy Association support CBD as a treatment for a range of epilepsy conditions. The FDA has even approved certain CBD medications to treat epilepsy. Among the many reported beneficial effects of CBD Vape Oil are anxiety and mood disorders. Research studies have indicated that CBD can help reduce social anxiety, panic disorders, and even PTSD. Further research is needed, but, we know that CBD helps to elevate “feel-good” neurotransmitters in your body, which may help offset mood disorders. While CBD Vape Oil hasn’t been connected with any severe side effects, there are few side effects to be conscious of when vaping. At high doses of CBD, there have been suggestions that CBD users can experience drops in blood pressure. Dips in blood pressure have been associated with feelings of lightheadedness, so it’s important to be mindful whenever taking CBD, especially if you have a history of blood pressure issues. The endocannabinoid system is known to affect salivary secretion, which may lead to lower levels of saliva production resulting in dry mouth. This is one of the more manageable side effects to handle, as you can always hydrate yourself. While this may seem counterintuitive because of CBD’s supposed increased alertness, at very high doses individuals may experience tiredness and fatigue. This could be because of CBD’s “biphasic” nature, meaning it has differing effects at low and high doses. At small to conventional treatment may lead to greater alertness will a large dose may induce drowsiness. Compared to many other medications or treatments, the potential side effects of CBD Vape OIl are minor. As a consumer, you can feel confident about taking CBD Vape Oil, as the benefits far outweigh any side effects. We have given a pretty thorough description of potential beneficial CBD Vape Oil effects, including possible side effects. Now that you are armed with that information, it’s up to you to decide whether or not to experience the impact of CBD Vape Oil for yourself. If you choose to try, we encourage our readers to try our very own CBD Vape Oils, which are available in 12 delicious flavors and multiple potencies.